I managed to drag myself away from this weekend’s Shadowhunters Netflix binge for long enough to bake something special to celebrate my all-time favourite fictional series – Harry Potter. Today is Harry’s (37th?) birthday, so I’m going to be munching one of these Butterbeer Cupcakes later on in his honour. If you’ve been to the studio tour in the UK, or Universal Studios in the US, then you might have been lucky enough to get to try some official Harry Potter butterbeer for yourself. If not, then it’s basically butterscotch meets cream soda, with some serious artificial foam that gets added on top to give it an ‘authentic’ beer vibe. It’s probably a bit of an acquired taste – I’ve not actually seen someone finish a whole tankard. 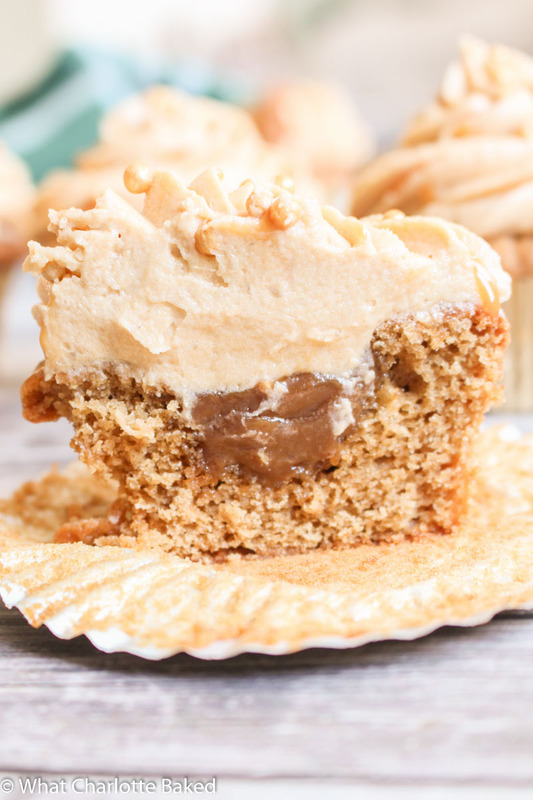 But, these butterbeer cupcakes, filled with an easy homemade butterscotch sauce, and topped with creamy butterscotch frosting, are definitely more of a favourite. Butterscotch is a type of caramel, but made with dark brown sugar. 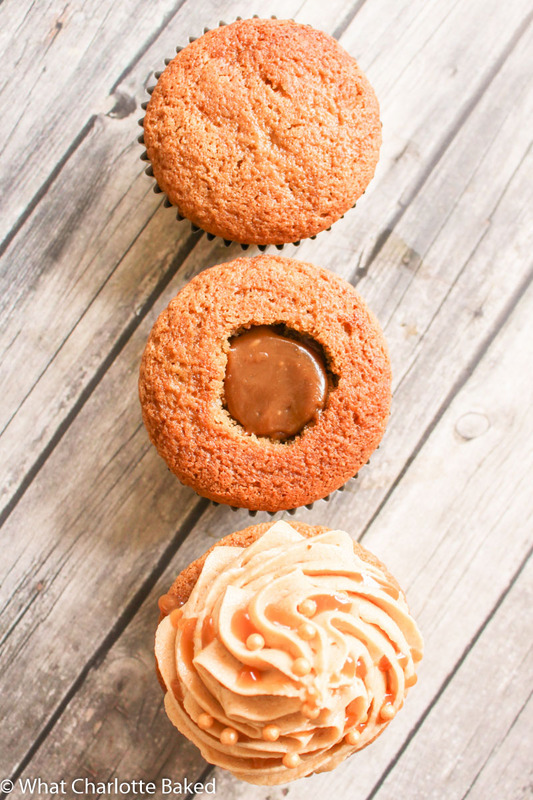 The butterscotch filling you’re going to pipe into the middle of these gorgeous cupcakes is homemade, but please don’t be scared. It’s honestly a really easy method, and you don’t even need a candy thermometer. Promise. The cupcake batter itself is based on my beloved vanilla cupcake recipe, but with some added butterscotch flavoured Angel Delight. If you don’t live in the UK, then butterscotch flavoured pudding mix is what you are looking for. This powder gets added to the cupcake batter, and gives it a gentle butterscotch flavour. 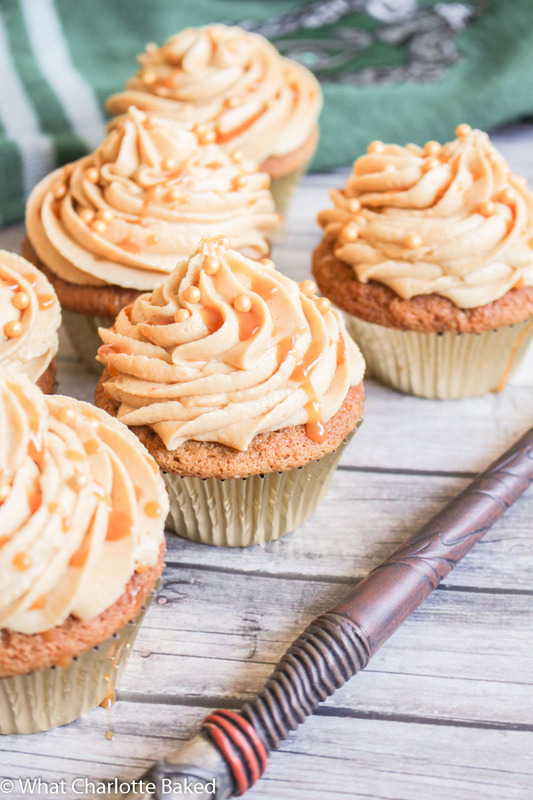 Once you’ve baked your butterbeer cupcakes and filled them with your homemade butterscotch sauce, you’re going to need to frost them. And for these cupcakes we are going to be using a special type of buttercream that’s made using cream, flour, and sugar. If you’ve been around here before then you will recognise this method from my Strawberry Eton Mess Cupcakes. It’s a bit of a weird one to get your head around, but it results in a much creamier and less sweet buttercream, that genuinely does taste like fresh cream. This is going to help give the frosting a cream soda sort of taste. You’re also going to add a packet of butterscotch Angel Delight (or pudding mix) to the frosting, as well as a generous helping of vanilla extract. I attempted to reduce down some actual cream soda and flavour the buttercream with this, but it isn’t strong enough to really bring anything to the party. If you know me at all, then you probably know that I’m a Slytherin through and through – hence the Slytherin scarf in the background of today’s photos. But I’m sure that Slytherins, Ravenclaws, Hufflepuffs, and even those pesky Gryffindors can all get behind having their favourite drink turned into a cupcake. I’m seriously rubbish at these side-on cupcake shots. In other (non-Potter) news, Emily from Emily’s Recipes and Reviews has ever so kindly featured two of my recipes over on her ‘recipes to finally try now love island is over‘ post, so you should definitely get on over there and check that out. Her Malteser Macarons look incredible – and have given me the urge to get in the kitchen this weekend and get my macaron back on. 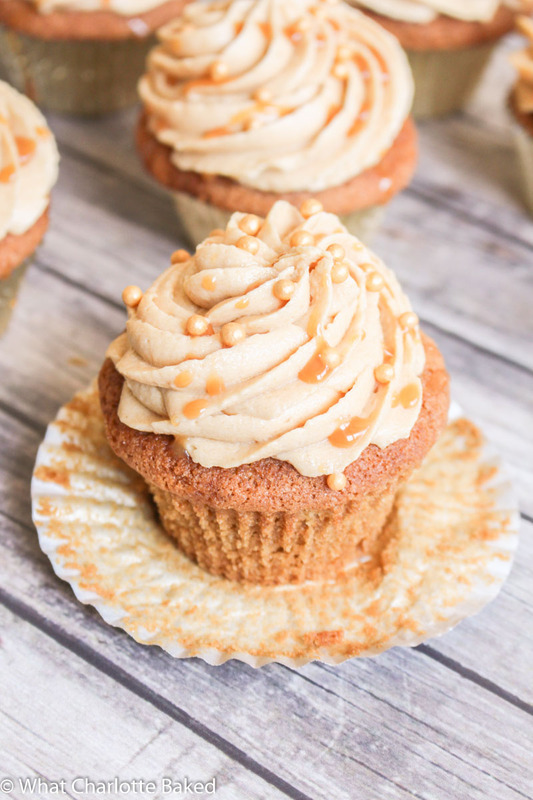 Harry Potter's favourite dessert (probably) - these butterbeer cupcakes are filled with butterscotch sauce, and topped with a creamy butterbeer frosting. Preheat the oven to 180°C / 355°F (160°C fan) and line a 12-hole muffin tin with cupcake cases or liners. Add the yogurt, angel delight powder, and vanilla extract to the bowl and beat well for a minute or two, scraping around the sides of the bowl to make sure the batter is well mixed. Add the flour, cornflour, baking powder, bicarbonate of soda, and salt and fold together on a low speed until well combined. Spoon the batter into the cupcake cases, filling about two thirds full. Bake in the preheated oven for 15-20 minutes, until springy on top. A toothpick inserted into the middle of the cupcakes should come out clean, without any crumbs on. Leave the cupcakes in the tray to cool for five minutes, and then remove and place on a wire rack to cool completely. Add all the butterscotch sauce ingredients to a saucepan and heat on low, stirring occasionally, until all the butter has melted. Increase the temperature to medium and bring to a gentle boil, and then cook for five minutes. Make sure to stir the mixture occasionally to stop it catching on the bottom. Once boiled for five minutes, remove from the hob and leave to cool in the saucepan until needed. Place the flour, sugar, salt, single cream, and vanilla extract in a small saucepan, and whisk together. Heat on medium-low, whisking occasionally so it doesn't stick to the bottom of the pan. Once the mixture starts to get a little lumpy, then whisk continually whilst still on the heat for two minutes or so, until a nice thick paste forms. The paste should hold its shape for a while when drizzled back on itself (like cream at soft peaks). Remove the saucepan from the heat, and leave to cool for a few minutes. Pour into a small bowl and cover the surface of the paste with clingfilm to stop a skin from forming, and pop in the fridge to cool (this may take up to an hour). Beat the butter for at least five minutes in a stand or hand-held mixer. Once light and fluffy, add the cooled flour paste one third at a time, beating well between additions. Once combined, add the butterscotch angel delight powder, and mix well. Once the cupcakes are completely cool, remove the middles of the cupcakes using an apple corer or a knife, making sure not to cut right to the bottom of the cupcakes. Pipe or spoon some butterscotch sauce into the middle of each of the cupcakes, filling all the way back up to the top. Using a piping bag fitted with a large star nozzle, pipe swirls of the buttercream on top of each of the cupcakes. Top with drizzles of the remaining butterscotch sauce and some edible gold balls. The cupcakes will stay fresh for 3-4 days. The unfrosted and unfilled cupcakes can be frozen for up to three months. Defrost at room temperature overnight and then fill and frost. You can also frost these cupcakes with regular buttercream if preferred - add the packet of angel delight to give it a butterscotch flavour. These look so amazing, Charlotte! I’ve been thinking about Harry’s birthday all day, but didn’t get a real chance to bake anything in honor of the actual day. Maybe I’ll try these out next year. Or for Hermione’s birthday in September. I must say, I’m happy to have found a fellow Slytherin. People usually look at me sideways when I say I’m most definitely a Slytherin, but they’re clearly just jealous 😉 I’m perfectly happy with my house placement and it looks like you are, as well. Stay cunning, my fellow baker. Thanks Kristine ? Slytherins are just misunderstood! ?